In 2015, more than 200,000 Afghans arrived in Europe fleeing violence in search of greater economic opportunity and better living conditions. The year was one of the “bloodiest on record since 2001.” In April 2015, the United Nations Assistance Mission in Afghanistan (UNAMA) reported that in the first three months of 2015, civilian casualties were 8% higher than during the same period in 2014. During this period, the number of Afghans displaced internally by conflict increased as the Taliban intensified its ground offensive. 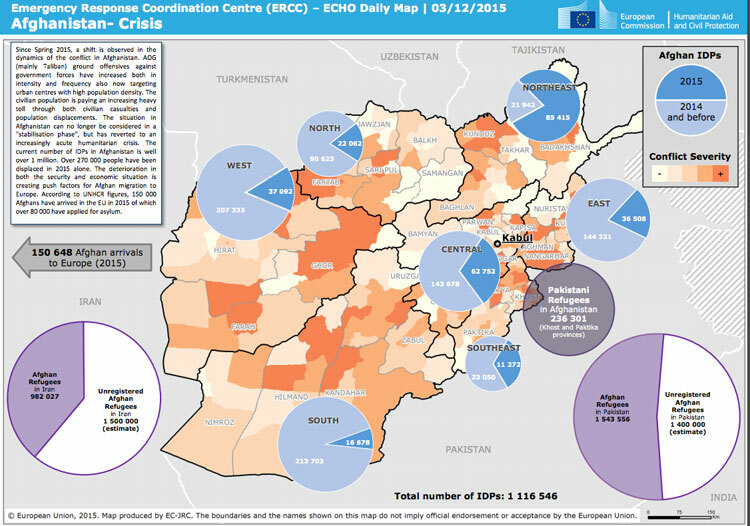 Over the course of the year, security situation worsened in Helmand, Nangarhar, northern Baghlan, and the Khost province culminating in the capture of Kunduz in September 2015. In addition to escalating violence, two devastating earthquakes in October and December 2015 affected another 150,650 people across the country. More than 1.1 million people were internally displaced by the end of the year with women and children mostly living in rural and semi-rural areas being the most affected. Amidst this political instability and an increase in the number of Afghan nationals making the perilous journey to Europe, a leaked discussion document titled “EU Restricted” prepared by the European Commission has laid down a road map to deport more than 80,000 Afghans from Europe. The European Commission, using its chequebook diplomacy, has plans to leverage the massive aid it provides to the Afghan government to implement the deportation of tens of thousands Afghan nationals it considers as economic migrants. The paper also considers Kabul and other urban areas as “safe spaces” where Afghans can return to “safety”. While the mass deportations are yet to begin, the International Organization for Migration (IOM) states that there were 304 voluntary returns of Afghan nations in 2015 and another 125 early this year. Under Germany's REAG/GARP return program, the German government pays the travel expenses for Afghans voluntarily willing to return home. An interview conducted with H, a young Afghan man who recently returned voluntarily from Germany reflects the complex nature of articulating the Afghan crisis. H’s family fled to Peshawar during the Taliban years. His family returned in early 2006, and now live near the Pul-e-Charkhi neighbourhood in Kabul. During the course of the interview, H repeatedly stressed that he was motivated to leave due to deteriorating security situation in Kabul. But also spoke about the growing unemployment, endemic corruption and the aspirations of a comfortable life in Europe. A university dropout, H claimed that he had not managed to find employment or a regular source of income since 2010. He had worked as a painter, a guard at a café frequented by expats that has since closed, and as a part time interpreter for a local security firm. With the number of UN staff, expats and journalists now abandoning Kabul, even the part time work he had managed till 2010 has decreased drastically by late 2014. Most of the money spent by the Americans in Afghanistan profited the expats, rich Afghans, politicians and war lords while the vast majority of the country had seen very little of the aid money. H started seeing people in his neighbourhood leaving for Europe sometime in late 2014, and spoke about a large network smugglers and agents in Kabul who facilitate the perilous journey to Europe. H was introduced to a local “agent” through a family member who promised a visa to Turkey and further travel arrangements to Europe. This “agent” spoke about the “success” of Syrian asylum seekers fleeing to Europe, and Germany’s open borders policy that guaranteed money on arrival, work, and easy citizenship. The Turkish Embassy in Kabul charges 60 USD for a single entry visa, and 200 USD for a multiple entry visa for Afghan Nationals. However, H claims to have paid 4000 USD to his agent for the same visa and another 3000 USD for the onward travel to Europe. He borrowed from friends and his parents sold a small plot of land they owned to make the final payment. He flew to Turkey and then crossed into Greece, making his way up through Macedonia, Serbia, Hungary, Austria and finally to Germany with a group of young Afghans. Arriving in Germany, H found himself housed in a small apartment in the city of Neu Olvenstedt with 5 other migrants. During his time in Germany H’s was amongst the 400,000 asylum petitioners waiting to be processed. Without work, he soon ran out of money and the government stipend was just enough for food. As more refugees and migrants arrived in his neighborhood competing for limited resources, skirmishes between various refugee groups and the locals became increasingly violent. After a violent stabbing incident near his building, H decided that it was time to return. Video was filmed by Francesco Conte who is the founder of Rome-based Termini TV.